* Majical Monday - Color Combo Challenge - use any shades of Blue/green/white. Make these colors the main theme for your project. * Stamp, Scrap & Doodle Saturdays: SSDS Week 36 - use bows, buttons and bling! What a great card. I love that image and your papers. Sweet card, I love your image! Thanks for joining us at SSDS. I love all the buttons and bows. 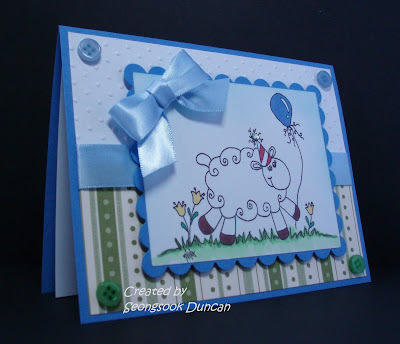 Very cute card, love the sheep! What a happy image! Thanks for joining us at SSDS this week! 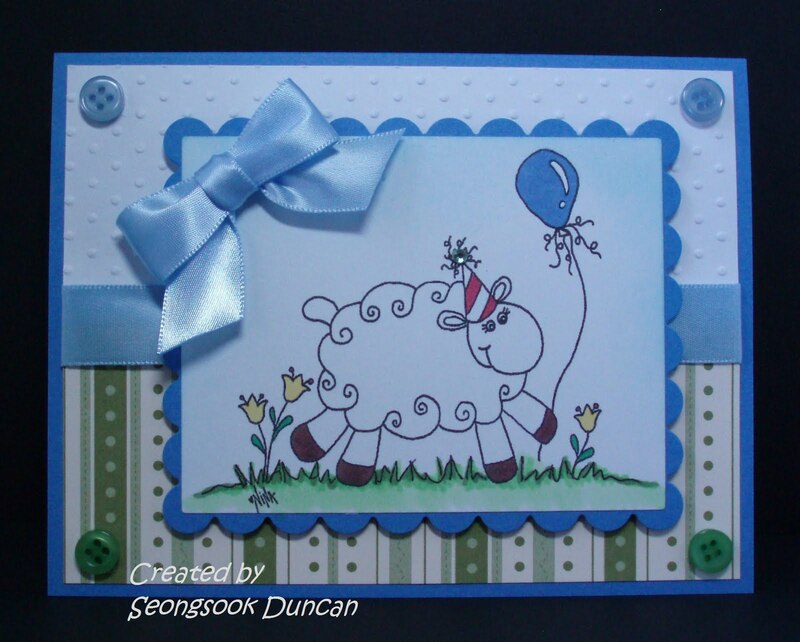 What a beautiful card you've made with Nina's image Seongsook! I'm so glad you joined us this week at TMITA/PCC and hope you can come back for next weeks challenge too! Good Luck! Absolutely adorable creation, Seongsook! Love that bow!!! Thanks for playing with us this week at TMITA/PCC and I hope you can make it back next week too! Look at you go girlfriend! Great combination of the challenges and what a beautiful work of art! Thanks so much for playing along with us at TMITA/PCC! oh your card is sooo sweet! I love that blue ribbon, oh so pretty!! the pp is just lovely and those little buttons just perfect!! Also love the little rhinestone on the hat! too cute! Thanks for playing along with our challenge this week over at TMITA/PCC! Hope to see you next week! Your card is fabulous Seongsook. Thanks for joining us at TMITA/PCC this week. Hope to see you again next week.